Number Of Compartment: No partition, one spacious compartment, enough to hold your daily items. With our vast experience & knowledge in this field, we are engaged in manufacturing a quality-assured range of Printed Cotton Bag. Multi color bag in pure cotton. Hand made bag, very stylish. Small teddy on bag chain holder. 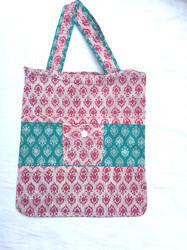 designer cotton handbags with patch and gold print work.